With a new workweek getting under way and no end to the BART strike in sight, Bay Area commuters set their alarms early again and set out on buses and ferries to make the long journey to work. Charter buses provided by BART picked up passengers at nine stations throughout the East Bay this morning. BART spokeswoman Luna Salaver said 114 buses carried about 5,900 passengers into San Francisco. The buses, which were free, were mostly filled up by 7:15 a.m., she said. Sixteen of those buses ran out of the Walnut Creek BART station, and all reached capacity quickly, Salaver said. Other busy pickup points included the Concord and West Oakland stations. Those who took the buses received a free ticket for a return trip from San Francisco to the East Bay during the afternoon commute. On the San Francisco Bay Ferry, 12 vessels were in service this morning, with commuters filling up the boats at the transit agency’s terminals throughout the Bay Area, ferry spokesman Ernest Sanchez said. “So far, ridership is heavier than it was on Friday,” he said. There were 7,150 passengers Friday morning. Today’s figures have yet to be tabulated, Sanchez said. At most terminals, operations went smoothly despite large crowds, according to Sanchez. However there were a few boats that left from Oakland that reached capacity before everyone in line could board, Sanchez said. For those taking the ferry back to the East Bay from San Francisco this afternoon, Sanchez advised arriving before the peak commute hour, which starts around 5 p.m. The last ferry leaves San Francisco at 9 p.m., he said. John Goodwin, spokesman for the Metropolitan Transportation Commission, said the peak time for commuters is much earlier during the strike than on a typical day. The commute is starting around 5 a.m. At the Bay Bridge, the metering lights were activated at 5:30 a.m., which is about an hour earlier than usual, Goodwin said. 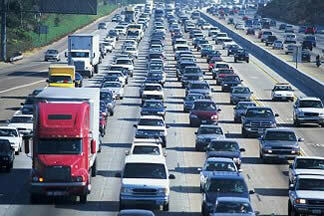 Traffic was particularly heavy this morning on southbound Interstate Highway 80 from Pinole to the Bay Bridge. Friday morning’s commute saw the worst congestion on northbound Interstate Highway 880 in Hayward heading to Oakland, according to Goodwin. In San Francisco, police and the California Highway Patrol will be beefing up patrols at key intersections near approaches to the Bay Bridge where traffic is heaviest. He said that based on Friday’s congestion on city streets, more units have been requested. Also because of issues that sprung up Friday, the regional transportation agency is trying to ensure that more drivers are available to pick up casual carpoolers in San Francisco during the evening commute. Goodwin said there has been an imbalance, with the pool of riders waiting to be picked up outnumbering the drivers offering space in their cars. East Bay-bound drivers can pick up passengers on Spear Street between Howard and Folsom streets in San Francisco. To lure more drivers to fill up their cars, a “street team” will be giving out $5 Peet’s gift cards to those who pick up passengers this afternoon, Goodwin said. The Golden Gate Ferry saw an uptick in passengers on Friday, and there were also more people driving on the Golden Gate Bridge. Friday saw 1,932 ferry passengers on the Larkspur ferry, while on the previous Friday there were 1,792. On the bridge, 18,993 cars crossed the span Friday morning, which was 581 more vehicles than during the same morning period the week before. Although there is limited parking near the Larkspur ferry terminal, a free shuttle for ferry riders is operating along Sir Francis Drake Boulevard. “The Wave” shuttle picks up passengers on a route between Fairfax and the Larkspur Ferry Terminal during the morning and afternoon commute hours. The San Francisco Municipal Transportation Agency is continuing to operate extra bus service on certain Muni corridors including the 14-Mission lines, and the J-Church and N-Judah Muni Metro lines.